Today I share with you the second of the (thus far) three images that have emerged from my recent pull to create. Unfortunately, I only took one image of this work in progress. It had started on a canvas that had several layers of various blue paints. The original painting had just been a play with color and movement, allowing the brush to sweep across the canvas as it mimicked my mood and breath. The result was a rather dramatic painting, but again, one that had no focal point and simply wasn't finished. The final image was created after hours of drawing and painting, and several days of just sitting with the painting, waiting for images to emerge. In this piece, it is her face and her posture that speaks most to me. She calls us, gently commands that we enter the night, the darkness. She offers an invitation, but has no doubts that we will accept. We must accept. This that we fear exists whether we acknowledge it or not. The darkness walks hand in hand with the light, death is a consequence of birth. She sees us in the darkness, stumbling, running towards light, and simply holds out her hand. Come now, she says in the voice of a stern but loving mother, why are you fretting so? 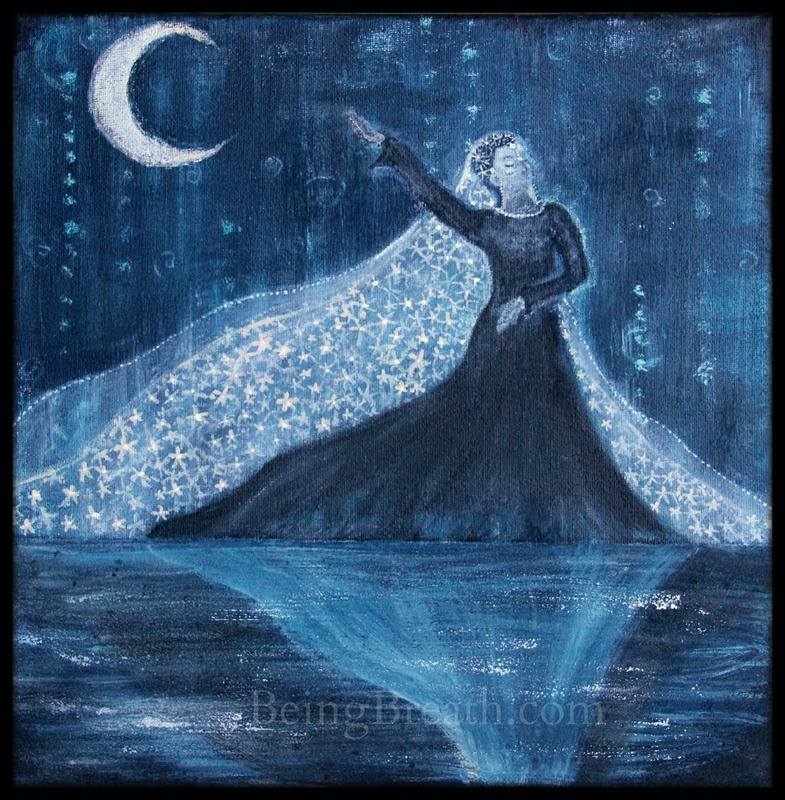 She walks on a shimmering water, balancing on that which is constant change and fluidity. She does not fear this change - she is quite familiar with it in the darkness. She place places one foot in front of another, dancing with an alluring strength .... she does not need to ask us to join. We will drown if we refuse. This change upon which we try to build our lives is an illusory surface. Move, she whispers - and is that a smile on the corner of her lips, behind that glittery veil? - move. Reminder: Prints will be available soon in my Etsy shop. If you are interested but afraid you might forget, sign up for my newsletter - I'll send a reminder straight to your inbox!